From the paper mills on the West coast, to textile mills on the East coast, and to the hospitals and airports in the Midwest, Permatron’s commercial air filters are the original industrial workhorses of permanent, washable electrostatic air filtration for better air quality. Model IN and Model HFA filters are the best and the oldest washable electrostatic air filters available today. Permatron commercial air filters come in a wide range of sizes – or can be quickly custom built to suit any requirement. Model HFA is our high efficiency commercial filter, containing a combination of white woven electrostatic polypropylene and white nonwoven polyester for increased arrestance efficiency, wire reinforced in a galvanized steel frame. Model HFA is ideal for facilities that require a high particle arrestance efficiency. Model IN is our durable, high velocity air flow commercial air filter, containing multiple layers of white woven electrostatic polypropylene fabric with a high waffle construction and wire reinforced in a galvanized steel frame. Model IN is ideal for facilities that require low air flow resistance, high velocity air flow is pushed through limited filter surface areas or high dirt load filtration with easy cleanability. 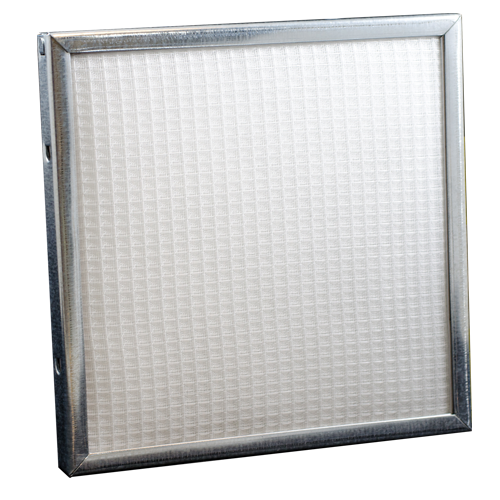 Commercial grade Model IN electrostatic air filter will outperform and outlast a metal mesh panel filter in many applications. Model IN with a stainless steel frame works well in wet, marine environments where mold and bacteria can be a concern. The Model HFA and Model IN air filters carry a 5 year warranty. The benefits of cleanability and long-term durability in high air velocity HVAC systems or caustic environments means Permatron commercial air filters offer the cost effective, energy efficient and environmentally friendly solutions to your panel air quality filtration needs. Both models are available with a stainless steel frame, upon request. Customized wire reinforcement is available for clean-in-place maintenance programs. These air filters may be sprayed with a detergent and water rinsed or vacuumed for dirt removal. Permatron commercial filters feature FDA approved components for use in food service and food processing applications. How do Permatron Commercial Electrostatic Ensure the Best Air Quality? Utilizing Permatron’s exclusive Accumulator Chamber design, these filters consist of two electrostatically charged fabric panels separated by our unique Accumulator Chamber to produce a very effective three-stage filtration process. This design has been in use since 1957 and proven highly effective in commercial and industrial HVAC systems. Utilizing two electrostatically charged fabric panels separated by our unique Accumulator Chamber produces a very effective three-stage air filtration process for commercial applications. The first air filter media panel (the prefilter) attracts and holds airborne particulates. 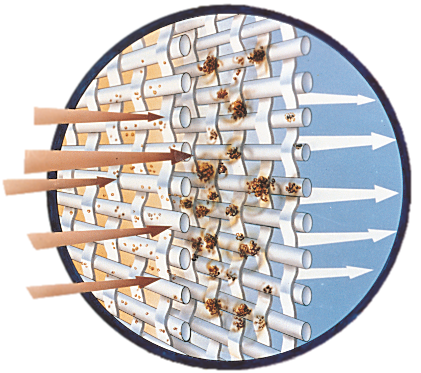 When particulates build up on the filter’s prefilter, airflow forces them to break off and collect in the Accumulator Chamber where turbulence and electrostatic forces cause agglomeration into even larger particulates. These agglomerated particulates are too large to pass through the second panel (the afterfilter). The filter’s afterfilter attracts and holds the smaller particulates that may have escaped the prefilter, or particles that do not respond to an electrostatic charge. Permatron commercial electrostatic air filter materials feature an inherent electrical charge which enhances filtration. These commercial electrostatic air filters draw particulates onto the air filter media material like iron fillings onto a magnet. Static electricity charges do not dissipate over time or require either grounding or insulation. Using a unitized filter bank design, Permatron’s electrostatic filters promote free air flow with superior dust holding capacity while resisting face loading. 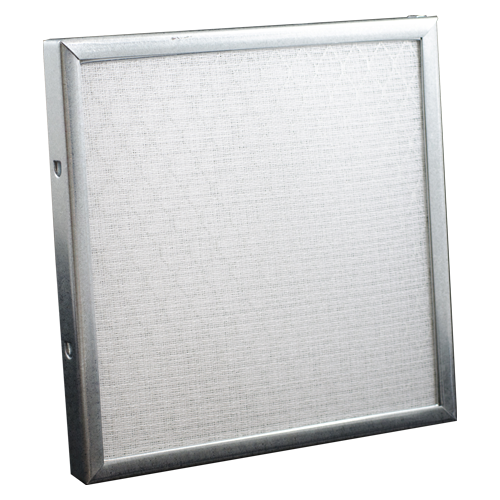 The filter’s steel outer frame features strategically placed drain holes for thorough cleaning. No system modifications or electrical hook-ups are needed. Model IN and Model HFA are available in any custom size you require up to 1,000 square inches in a 1/2″, 1″, 2″ or 4″ thick galvanized steel frame. Over 1,000 square inches is available, but requires special handling, and is not recommended. For this application, Permatron recommends that larger commercial air filters be manufactured in two pieces and the frames butted together and held in place with our Z bracket. Stainless steel frames are available and recommended for caustic or corrosive environments. Cleanability and long-term durability in high air velocity systems or caustic environments means Permatron commercial air filters deliver a cost effective, energy efficient and environmentally friendly solution to your panel filter needs.